Well, not Darwin himself, exactly. The Evolution Directory (better known as "EvolDir") is a mailing list run by Brian Golding at McMaster University, Ontario. It's widely used by evolutionary biologists to post announcements about jobs, courses, conferences, software, and other topics of interest to the community. In this age of spam- and administrivia-clogged inboxes I find it hard to keep track of emails (and routinely ignore most), so it occurred to me that I'd pay more attention to EvolDir if the announcements were made over twitter. Hence, I wrote a script to monitor my email account for EvolDir emails, and post any announcements to twitter. You can follow EvolDir by going to http://twitter.com/evoldir. One complication was working out a URL for individual EvolDir emails. To make my life simpler I created a simple web archive of each individual email. As a by product of this there is now an RSS feed for EvolDir, available from http://bioguid.info/services/evoldir/, if RSS is your preferred means of consuming news. I've added the EvolDir RSS feed to the Systematic Biology web site, so that visitors to that site can see the latests announcements from the evolutionary biology community. 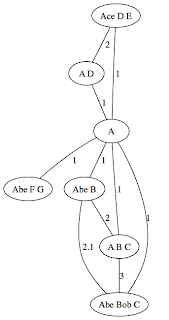 In this example, the names "Abe Bob C", "A B C", and "Abe B" are equivalent, as are "Ace D E" and "A D", leaving "Abe F G" by itself.